A beautiful sleek ultra-modern stool constructed from 3/4" square tubing. The seat is 16 1/4" square. Available in any seat height between 18" and 34". Please see our spectator stool section for the 35" and 36" version of this stool. 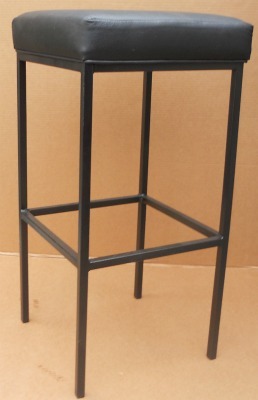 This is not a cheap imported stool constructed of 18 to 20 gauge steel and bolted together to save on shipping costs. One monolithic weldment from 16 gauge steel for a lifetime of commercial use. 1.88 - 44 foam for a 15 year seat life before the foam starts to break down.